Occasionally comes a deep, thoughtful and beautiful TV series. 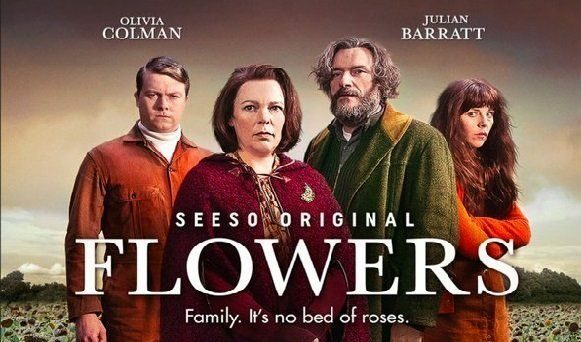 The second series of ‘Flowers’ was screened this week, (the first being just as brilliant). Written by the gifted Will Sharpe. This family’s dysfunction is clear, yet they are offered as characters imbued with a deep and complex love for one another, which they mostly seem unable to express. In this darkly funny series the daughter has manic depression and becomes gradually lost inside her mental torment. The family seem to bump into each another emotionally like bumper cars, without really connecting. It is love that offers hope. Love that they can barely express at times, then there are moments when this shines through. ‘Shun’ lives with the family but he knows darkness too, as he is alienated from his country, his home and by the deaths of everyone in his family. Being a part of and apart from, he acts as a wise commentator on what is happening. Although he is all about show don’t tell! He knows absolutely that we do not know how much love there is until we lose one another and that the bonds of a family are powerful and potentially healing. Basically, we need each other, even when we think we don’t! Mental health in families is something most of us experience at one time or another. It is baffling, frightening and lands or develops within our family systems and all adapt within it in their varied and creative ways. Yet the individual is the one who lives inside their unique world and experience, often out of touch with those around them, often unreachable because they have lost themselves. Psychosynthesis teaches us of the ‘people inside us’, the parts of us that drive us in different often conflicting directions. If, (like people within a family), we do not find a way to harmonise and integrate these wonderful, adaptive and creative aspects of ourselves, we can start to feel lost, depressed and a deep panic that somehow, we are not being who we need to be. We may develop addictions to manage this feeling of alienation and in turn damage ourselves, our families and relationships. We may feel emotionally disturbed by anxieties, panic and depression. Often not liking certain aspects of ourselves we banish them to the basement of our being where they can still find a way to manage and control our behaviour in ways we do not want. Anger repressed comes out sideways in harm to ourselves perhaps or others. Families too can hide ignore or try to control a loved one’s mental health or addictions. This rarely works and is often unloving. So, in a family or an individual, if the one with difficulties can’t be open and honest about their real self with the many, there will be fragmentation, dysfunction and alienation. My thought today was just how vital to our mental health and well-being our close relationships are. We are social beings. To begin to try to heal ourselves and our relationships we require a social setting – be it a family, a recovery group or individual/couple therapy. We need love to reach us in our dark and broken places, and to accept ALL of who we are. We need the unconditional love of those around us. Flowers clearly showed that it is only possible to really become honest when there is love and this is expressed through true empathy. Shun knows their pain because he has had so much of it himself. He understands, and he loves them. He can show them what loves does, so that they will cling to one another when the darkness gets deep – and that is their only hope for healing and harmony.